Note: This is a rewritten version of this post from a year ago. We’ve long been suspicious of church metrics and of the increased reliance on quantitative measurement in the UMC here at HackingChristianity. As the supervisory distance increases due to fewer district superintendents and larger districts, the church leadership is by necessity choosing to emphasize comparative metrics. While helpful for accountability for what they are measuring, are there ways to show the metrics system is flawed so that what the church is measuring doesn’t translate to what the church leadership really values? 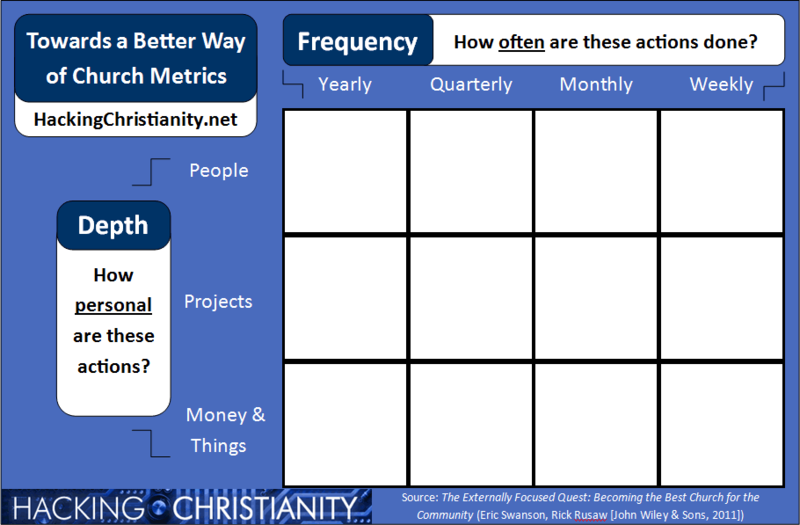 Basically the idea is that you place a dot or something in each square to indicate where your church has a program or person or offering regarding outreach and its frequency. Then you evaluate. Are there a ton of events that happen yearly and raise money (or donate materials ie. “things”)? Are there more programs that happen weekly and have lots of volunteers? You can see how this splits our outreach into categories to see where the needs are. So this is a great chart. But it’s not only great in a utilitarian way for your congregation (feel free to borrow it! ), but also to illuminate the problem with church metrics in the United Methodist Church as it stands. I have an example chart here. What I did is I filled it in with TWO different churches that have filled in the same reporting number (dollars, people, people served) with very different actions. So you would compare the two orange boxes. Or compare the two reds. Check out the chart and we’ll outline it below. For example, One church could (following the blue boxes) have one individual spending 52 hours once a year on a VIM trip. The other church could mentor one different child one hour a week and spend 52 hours in outreach. They would be quantitatively the same (52 hours reported at the end of the year) but qualitatively different (one served one family’s house, the other served 52 children on a regular basis). The Mission of the United Methodist Church is to make disciples of Jesus Christ for the transformation of the world. It seems that the things we should be counting should be about transformation, not accumulation. And the way church metrics are currently set up, we are doing the opposite. Expecting diagnostic metrics to fix things is like treating a fever with a thermometer. As it turns out, there’s more to waking up the churches than simply counting the sheep — something we knew all along, but couldn’t quantify. Indeed, we were barely able to articulate the alternatives to jotting down our numbers and struggling to find their meaning. 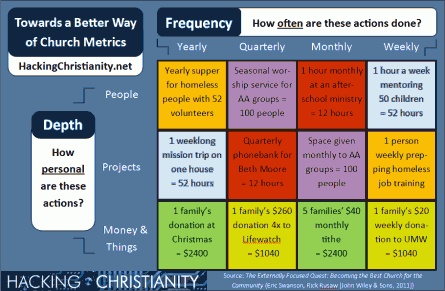 How can “alternative” metrics like this chart impact your ministry context? In what ways can we better evaluate quantitative and qualitative data together? How can increased supervisory distance be bettered (not replaced) by church metrics? You nailed this one and I like the fever analogy. 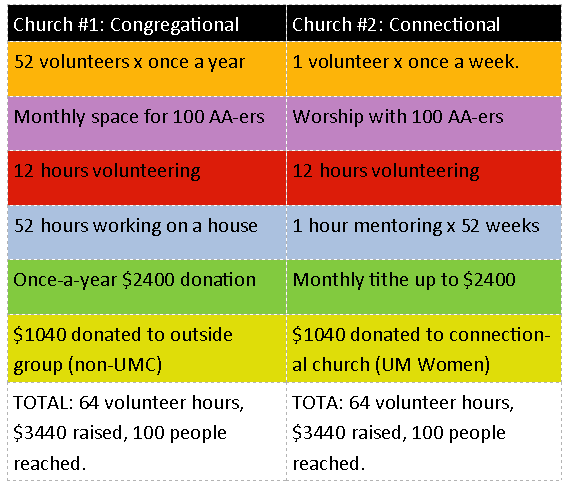 I was at a church that did more for it’s community than any other church in town, and reached a population that the UM church normally doesn’t reach. The apportionment system is just too heavy a tax on that kind of missionary church and because of that the DS hates that church and does everything to subvert it’s ministry. BTW the church was in an area where there were many other denominational churches, Baptist, Presbyterian, Disciples of Christ, & Church of Christ all within a few blocks. The United Methodist Church is the only one still open and doing ministry in that area. All the others have relocated or closed. Hardly unsuccessful. And yet perhaps quantitatively unsuccessful! Great example! I tell people at audit every year that behind every figure, number, or dollar they put on a piece of paper there is a name, a mission, a ministry. Metrics are only good insomuch that they track something else. If you turn in a worship attendance of 75 – who are those 75 people? Why do they come to your church? How were their lives changed? If you turn in that your church brought in $100,000 dollars this year – where did it come from? Who sacrificed to make ministry possible? If you spent $90,000 dollars this year – where did it go? As the old saying goes if someone looked at the churches checkbook what could they tell about our values and mission? Numbers tell a story, but they don’t tell the whole story. I track my churches metrics, but I know the people behind those metrics. Just out of curiosity, who knows about the numbers that are reported? I turn in my numbers and know that they get turned into the Conference. I know that other numbers are turned in but I never see a report. Is the congregation supposed to get a report on the numbers submitted and what they mean?